One of our favorite things about bicycle travel is visiting small towns. After being nomadic for three years and passing through literally hundreds of tiny towns, it dawned on us that bike travel could be a viable means to revitalize rural areas. Bicycles are slower by nature, but that is not always a bad thing. Because cyclists need to stop more and eat more, their potential spending in an area far exceeds that of someone traveling by car! This idea hit me in our tent in Montana a few years ago and I drew a little sketch in my notebook. It’s been almost two years since that little doodle and I’ve finally had a chance to animate it try to spread the message. From sketch to animation….many years in the making. Since we’re not actively traveling at the moment, our roles have switched from being active tourists to promoting and advocating for bicycle touring. In a way, we are simply trying to give back to this activity that we love so much. We’ve inspired many people to hop on their bike and go touring. After a lot of thinking, the next step for us is to inspire communities to welcome bicycle travelers. We’ve already begun some work in that arena, speaking at the Oregon Active Transportation Summit in Salem and addressing the Rotary Club and many elected officials in Waynesville, NC. It’s an exciting time and we hope you follow us in this new leg of our journey. If you are in a bike advocacy group or are in a community interested in the possibilities of bicycle tourism and would like to have us speak, send us an email. This is wonderful, thank you for sharing! There are hundreds of small towns in the US – from Cumberland, MD … to Norfolk, NE … to Clinton, MO who are benefiting in ways large and small from their proximity to major trails. There’s is no question that bicycle tourism can rejuvenate some out-of-the-way places. Neat video. A few years ago a suggestion was made to the Lincoln Bicentennial committee co-chaired by Ray LaHood, U.S. Transportation Secretary. It was to build an Abraham Lincoln National Greenway that would parallel the old Lincoln Highway––the first transcontinental auto road––through the heart of the country. Although the idea was not new it fell flat on its face. Perhaps there was fear that the project was too complicated and would involve budgetary commitments by 13 states. Possibly, too, we bicyclists have not made the case as aptly as that made in the video above. Just think of the number of town, cities counties and congressional districts that would be directly affected by a National Greenway and how many neighboring communities or districts could be tied into it. Keep on bikin’. We in Southeast Colorado met many great bikers of all ages this summer on their various treks. In trading stories about their small towns….and ours….we find so much in common to share. Thanks guys for your feedback on how we can do a better job of hosting for the next group of bikers who choose to visit us. Come and see us again next summer while you “Pedal the Plains”. This is a great video that we can share with small town tourism groups! Colorado has a program and available at BikeByways . org. I will check back often and add a link to this great site. It is so amazing how grassroot efforts just blow me away. Thanks so much! Also visit VoteTravel . org for more information. “Something so simple that it just makes sense”. It is. But, there is a problem in the US: people don’t get lots of time off. Avid cyclists are few and far apart and those who can afford longer tours timewise are even more rare so I really doubt they can make a real impact. We’re outnumbered thousands to one. The same thing has happened in the province of Quebec. One popular route has tourists meandering from one small village to the other, each complete with it’s own artisan specialties. The province built bike lanes on the shoulders of scenic but quiet river view roads and it is packed with tourists every summer. The organization “La Route Verte” travels across Canada showing other provinces how to cash in on bicycle tourism dollars and revitalize dying small towns. I’m curious if people and businesses along some of the established ACA routes think bike tourism is a net positive to their communities? As more people take up bike touring we need to be aware that we are advocates for those who come after and behave accordingly. The latest Adventure Cycling magazine reported some hosts along the TransAm were withdrawing their support and hospitality because of the entitled attitudes of the current crop of bike tourists. And most people traveling by bike are very careful to not spend too much. I agree that the the growing popularity of cycle touring is a plus for small town businesses, and small towns are a big plus for cycle tourists. This is a reciprocal relationship, and also an inevitable one. How many times have we counted on that dot-on-the-map with a capitalized name for dinner, only to find out that the only store there (or within 30 miles) is boarded up? Lodging, too, is a necessity, especially as we “tortists” grow in numbers— because while stealth camping in a private patch of woods works just fine when no one else is doing it, it’s a real problem for both property owners and future bike tourists when the act becomes a nuisance. 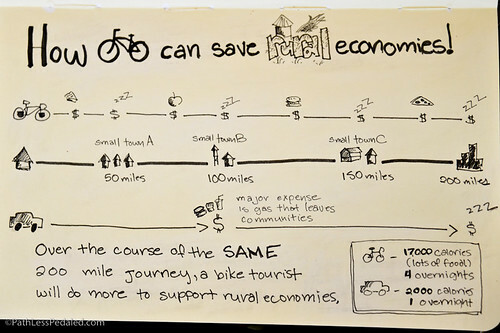 To address the needs of bike tourists, and provide a revenue stream for small towns, two separate markets will naturally develop. Thickening streams of cycle tourists (and their accompanying wallets) will not go unnoticed, especially in today’ s increasingly entrepreneurial economy. On one hand a B&B and/or restaurant appeals to weekend warriors with the money but not the time. On the other, a grocery store and a bare bones economy campground (mini camp) fulfill the needs of the more casual tourist who’s got the time but not the money. And the really good news is: All we have to do is take some responsibility, be polite, and make like the honeybees- travel wide and pollinate these little gardens with our appetites and contagious smiles. The infrastructure should more or less take care of itself. I emailed this question but didn’t get a response, so thought I’d try here. I am in need of creating a video for a project and love this simple format that you used here. I’ve searched high and low but am not finding anything similar. Would you share with me the resource used to create this great video? Thank you so much for all you are doing to promote cycling! Sorry didn’t get your email. To make the video it was a mix of Illustrator and Adobe After Effects and some sound software Audacity/Garage Band. We’re looking to do more for other organizations so email us at pathlesspedaled (at) gmail (dot) com if you are interested.